Heelman, a specialist CNC machine shop that focuses on small and medium batch manufacturing for customers across the automotive, aerospace and pneumatic fittings sectors, has expanded into a fourth adjoining unit at Ludlow Business Park. The family-owned manufacturing business which has operated in Ludlow since it was founded in 1982, has expanded its base so that it can better meet customer demand, drive operational efficiencies, improve the working environment and create new jobs thanks to two grants supported by the Marches Local Enterprise Partnership (LEP). Andy Styles, General Manager, said: “Increasing demand from both existing and new customers meant that we needed to review and improve how we managed our production so that we could manage this increased workload. 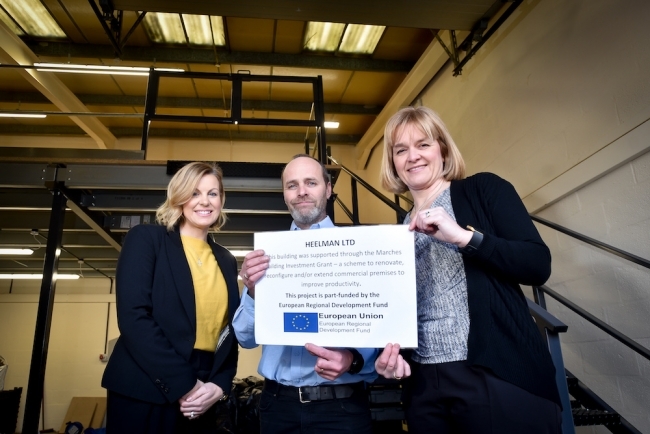 Heelman had already secured funding from the Manufacturing Growth Programme (MGP) to design and support the implementation of a new production control software solution and it was Catherine Bray, Manufacturing Growth Manager, who introduced them to the MBIG team. Heelman’s growth is also expected to lead to a potential 10% increase in turnover. Programme Manager Caroline Cattle, added: “It’s great to witness a grant applicant come to us via referral from one of our partners in the region as it allows them to benefit from all-round support and achieve a level of growth that may not have otherwise been possible.